Increasing governmental focus on energy security and climate change drives the uptake of large-scale solar as the leading renewable supply. The combined pressures of rising global energy demand, increasing concern about climate change, greater focus on the advance of ‘peak oil’ and heightened awareness of the challenges around energy security are driving many countries to look for alternative energy sources. While long-term prospects rest on technological breakthroughs and the wider adoption of nuclear energy to decrease the use of fossil fuels, as highlighted in the first section, the next decade is still very much one in which oil, gas and coal are the major sources of energy. With India and China growing fast, and so requiring ever more energy to fuel this growth, with the US still very much ‘addicted to oil’ and with governments yet to agree a global way forward, the energy world in 2020 will, according to International Energy Agency projections, still be over 70% fossil fuel based. However, by implication, over the next decade there will be a significant shift in the adoption of renewable, alternative energy supplies. Wind, wave, solar, nuclear, bio, hydro and geothermal generation are all pushing ahead, some with clear momentum and others with inertia yet to be overcome. As different countries are advocating different options, it is clear that there is no single global answer. Coastal locations favour wind turbines, mountainous districts favour hydroelectricity, Iceland is pushing ahead with geothermal, solar is the favourite of sunny regions and, while some countries want access to nuclear, many others do not. Talking through the problem in our workshops, it is evident that, globally, the next decade is one in which solar energy is expected to make the most headway overall. To achieve change in the first place, however, many experts drew attention to two key issues. Secondly, ‘it is not just about the technology; policy and markets are just as important’. This view is becoming increasingly clear as green stimulus packages start to take effect alongside the existing incentives already in place: Germany’s ‘feed in’ tariff provides a long-term guaranteed price for renewable energy that has made it a leader in solar energy development while the US government’s subsidies for bio-fuels have got the ethanol and bio-diesel market going across the Americas. Add in the failure of Copenhagen to agree any meaningful global targets, growing concerns over the environmental impacts of the Canadian tar sands and US government reaction to the Deepwater Horizon disaster and one can see a raft of new nationally focused policies on the horizon. As countries scramble to protect their supplies and gain individual energy security, and thereby steer away from what Shell sees as the ‘blueprint’ scenario of greater global cooperation, governments will seek to support the alternatives that are within reach from both a technological and economic point of view. Experience has shown that successful approaches work at many levels, so this combination of technology and economics also has to align with social acceptance and political will. Together, these factors will mean that we are likely to see increased investment in nuclear energy for those that have access to the technology. As such, by 2020, in support of the traditional centralized view of supply, there will be more nuclear power stations coming on stream than ever but, given the overall dynamics of the sector, there is unlikely to be a tangible shift in the percentage of supply that nuclear provides during the next decade. We are also likely to see increased investment in proof-of-concept schemes for wave power, but again this will not have achieved a significant scale by 2020. Geothermal and hydro will continue to be limited to certain geographies and many scenarios increasingly expect that the fuel versus food debate concerning bio-fuels will have been exacerpated by more spikes in food prices and government U-turns on subsidies. The fastest growing area of renewable energy supply at the moment is wind. Xi Lu of Harvard has suggested that ‘wind power in the US could potentially generate sixteen times the nation’s current electricity production’ – even when limiting locations to rural, non-forested sites and offshore. Moreover, ‘worldwide, wind energy under the same constraints could supply at least forty times the current electricity consumption’. What is uncertain, however, is the speed at which this capacity can be rolled out, at what cost and by whom. So, no one can say what the impact of wind power will be by 2020. A pivotal issue in any assumptions about wind power is that of materials availability. ‘In a world where telephone lines are routinely dug up so that people can resell the copper, using millions of tonnes of it in wind turbines seems unlikely.’ Alternative materials such as high temperature superconductors are now in trial applications, but the likelihood of being able to scale these up substantially within ten years is low. So, despite the optimism shown by some, many others surmise that ‘current growth in wind turbines will not be sustained’. This brings us to solar energy – a virtually limitless clean resource. In its most common form, photovoltaic (PV) panels convert sunlight into electricity. Typical current panels have an efficiency of around 10%, with more expensive ones achieving 20%. In the next few years, experts expect that this ‘may rise to around 40%’. In 2009, PV installations grew by 20% to over 7 GW of new installations globally. While Europe, led by Germany, currently accounts for nearly 80% of global demand, over the next few years, many anticipate that more large-scale solar power systems will be installed across the world, from the US and China to Africa and India. As German subsidies decline in line with cheaper and more efficient technology, a tipping point of commercial viability will occur. According to the US Department of Energy’s Solar America Initiative, PV solar energy will be competitive without subsidy by 2015. Just as with other technologies, increasing capacity will result in a steady cost decline and ‘across the supply chain, manufacturers are increasing cell efficiency, using thinner silicon wafers and increasing power in low light levels’. In the short term, the 2009 US Stimulus Bill, which included $60 billion in loan guarantees for companies building wind and solar plants, is giving a fillip to the US market. As Carol Sue Tombari of the US Department of Energy’s National Renewable Lab points out in her recent book, ‘Wal-Mart is aiming to meet 100% of its power needs from renewable energy’ and, as part of this, is already installing solar power on its supermarket roofs in California and Hawaii. In addition, Google, a huge energy user, has announced a partnership with Sharp for PV roof systems. Elsewhere, China has also introduced a subsidy for solar energy installations and in 2009 the Qinghai province gave the go-ahead for the world’s first 1 GW solar farm. More significantly, in January 2010 the Indian government launched its National Solar Mission, which is aimed at making India a global leader in solar energy and envisages an installed solar generation capacity of 20 GW by 2020 and 2,000 GW by 2050. While some countries, such as those in northern Europe, could get around half their electricity needs from PV and solar farms within their national boundaries, if they had access to solar power from other countries, solar could meet nearly all electricity demand. 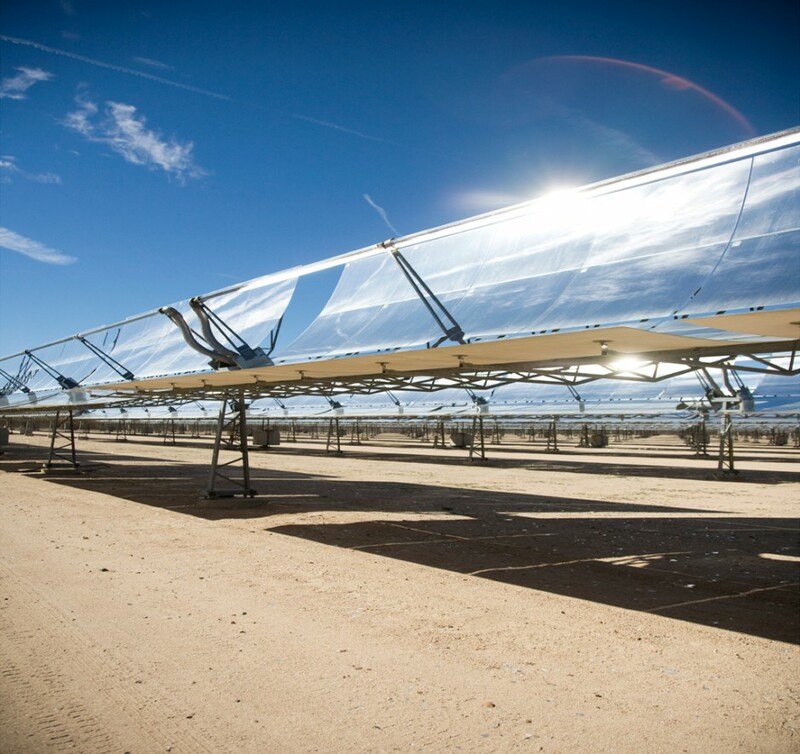 According to calculations by experts, including Professor David MacKay of Cambridge University, ‘a 100 km by 100 km square area of concentrated solar power (CSP) systems in the Sahara could provide enough power to meet Europe’s current demand’. Looking ahead, organisations such as DESERTEC are promoting the adoption of CSP in Mediterranean countries and high-voltage DC transmission lines as a credible way to provide Europe with secure, clean energy. The same arguments clearly apply elsewhere in the world and, some expect that they are likely to occur first in either India or China. As was pointed out in the most recent Technology Futures programme hosted by Shell: ‘Global energy consumption is around 470EJ per year. The sun delivers to the earth almost 4 million EJ of energy, so, theoretically, the sun could provide at least eight thousand times the energy we need.’ There is little argument that, ‘in the long term, all energy can be solar’ and it looks likely that the next decade will be when the shift to solar truly starts gaining momentum.